When I traveled to Japan earlier this year, I discovered a magical snack. We went to Shimoda for the weekend to soak up the beautiful beaches and there, we stumbled upon a tiny café that served Pizza Toast. The description on the menu was simple: Toasted Bread with Tomato Sauce, Cheese and Fresh Basil. You really can’t go wrong with that. I tried a couple techniques on recreating this at home. Traditionally they use a thick loaf called milk toast which has a very similar flavor and texture as brioche but lighter. 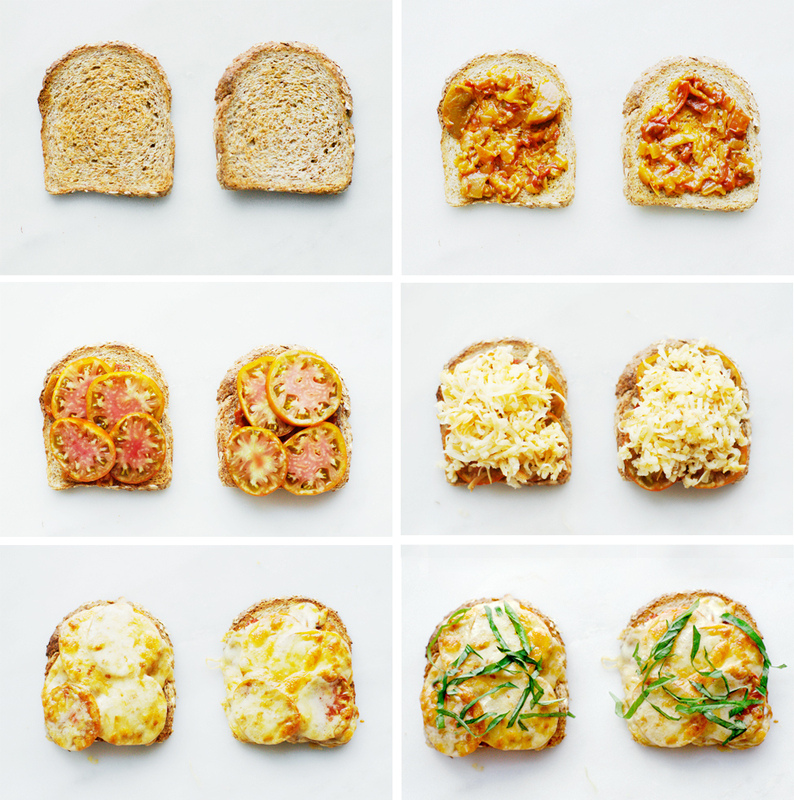 It gives you more of a “Chicago style” pizza toast. For this recipe I used sprouted bread since that’s what I had readily available in the fridge. Because the slices are thinner, it gives you a crunchier toast. The trick to making good pizza toast is using a toaster oven. If you don’t own one, just pop the bread in the toaster and melt the cheese in the microwave at 30-second intervals. For the toaster oven you want to make sure both sides of the bread are well toasted before adding the sauce and fresh tomatoes, this ensures a crispy crust opposed to soggy bread. The best way I’ve found is placing the bread on the wire shelf opposed to directly touching the pan. That way, both sides of the bread will be evenly toasted. Opposed to buying a large jar of tomato/spaghetti sauce at the store, opt for a smaller jar and a higher quality product. I love the Arrabiata Sauce from Holy Ravioli in Dallas. That ensures minimal leftovers and a better-tasting result. You can use any type of cheese that melts well aside from mozzarella like Monterey jack or provolone and use any herb you have readily available like scallions or cilantro if you do not have basil on hand. Place bread on a wire shelf and toast. Meanwhile, slice tomatoes and basil. Remove toasted bread from oven and place a spoonful of tomato sauce on each slice. Spread evenly on the bread and top with sliced tomato and shredded cheese. Bake at 375F (in toaster oven) for 4 minutes and then set to broil for 2 minutes, or until cheese is slightly browned on top. If you do not have a broil setting, bake until cheese is thoroughly melted. Finish with fresh basil and a little EVOO if you prefer. Show us your creations on our Instagram, FB and Twitter page -- we’d love to see what you guys come up with! Just use #onetwosimplecooking to follow along. And be sure to subscribe to our 1-2 Simple Cooking YouTube channel to stay up to date on our recipes and tips! 1-2 Simple Cooking is a trademark of 1-2 Simple Cooking, LLC.